The Halsey Taylor 4705 FR Endura™ Steel Drinking Fountain is a wall-mounted, steel outdoor unit with textured power coat finish and E-Coat immersion for year-round beauty with minimum maintenance. The E-Coat immersion process coats the outside and inside of the unit for the ultimate in corrosion protection. 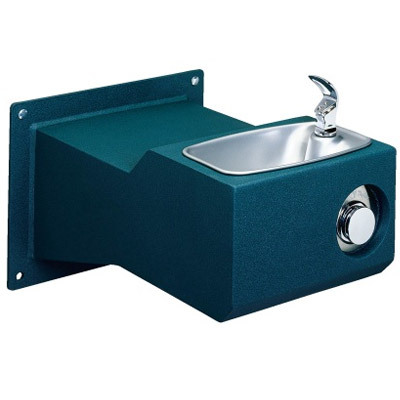 The Halsey Taylor 4705 FR is designed to be easily accessible to both physically challenged and able-bodied individuals and is ideally suited for installation in public areas and includes contoured-formed basin to eliminate splashing and standing water, and shall have rounded corners and edges. The Halsey Taylor 4705 FR meets state and federal requirements as defined by the Americans with Disabilities Act, is certified to lead-free compliance including NSF/ANSI 61, CA 1953 and the Safe Drinking Water Act. This kit will modify LK4400 Series Pedestal Fountains to provide the added ability to connect garden hoses or fill pails in outdoor application. This kit will modify LK4400 Series Pedestal Fountains to provide the added ability to connect garden hoses or fill pails in outdoor applications. Includes a panel with a door that can be locked with a standard padlock to minimize tampering (padlock not included). Makes rough-in and installation easier for all models of non-freeze resistant tubular fountains. Adding an optional color may delay shipment. As per Manufacturer's Policy, adding an optional color makes the Halsey Taylor 4705 FR non-returnable. Note: As per the manufacturer's policy, Freeze-resistant units are non-returnable.